The industry benchmark since 2004, the 215 hp Rotax 4-TEC engine introduced supercharged intercooled technology to the watercraft industry. The intercooler efficiently and reliably cools the air compressed by the supercharger, further boosting the intake charge density. In plain English, its the most efficient way to crank up the horsepower and torque of an engine while maintaining reliability and avoiding turbo lag.18 function digital information center with easy-to-read gauges for info at a glance. A hinge allows the cut and sew seat to open vertically and provide easier access to the engine compartment. Offers seating for up to 3 persons. Provides easier and more comfortable re-boarding in deep water. 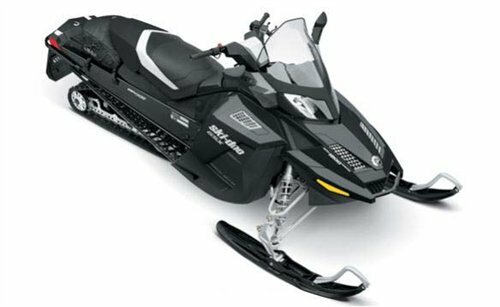 Ski tow eye for easy and secure attachment of ski rope.Wide handlebar provides more comfort and easier maneuverability. Our exclusive O.P.A.S. assists maneuverability in off-power situations. Side vanes automatically deploy for additional directional assistance. Adjustable mirrors increase field of view.Sea-Doo watercraft are some of the most environmentally-friendly boats on the water today. 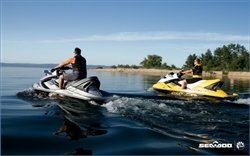 In fact, the entire Sea-Doo lineup is CARB 3-STAR certified from the California Air Resource Board for ultra low emission and BRP is the only manufacturer whose entire line-up is CARB 3-STAR certified. Unlike open-loop systems, which draw water from the riding environment directly into the engine, the CLCS uses coolant to keep the engine running at the ideal temperature, much like a cars radiator. Closed-loop cooling also keeps out corrosive saltwater and debris, meaning youll be on the water more and in the shop less. 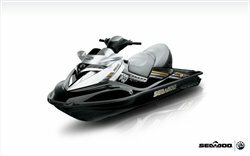 Standard on all models, the exclusive Sea-Doo Learning Key allows you to limit your speed to two choices: about 35 MPH (56 km/h) or about 50 MPH (80 km/h) or 45 MPH (72 km/h) for the 155 hp. A great way to save gas and perfect for less experienced riders who want to get used to slower speeds before letting it rip. Prevent unauthorized use with yet another innovation standard on all models. Your watercraft is embedded with a unique microchip that is engaged with your lanyard. Simple yet innovative, it�s much easier to use than code systems found on other brands. Standard on all Sea-Doo watercraft, this is our version of speak softly and carry a big stick. Our patented sound reduction system combines a series of resonators, acoustical foam and vibration-absorbing components to make Sea-Doo watercraft some of the quietest on the water.